OFFICIALLY SOLD OUT! 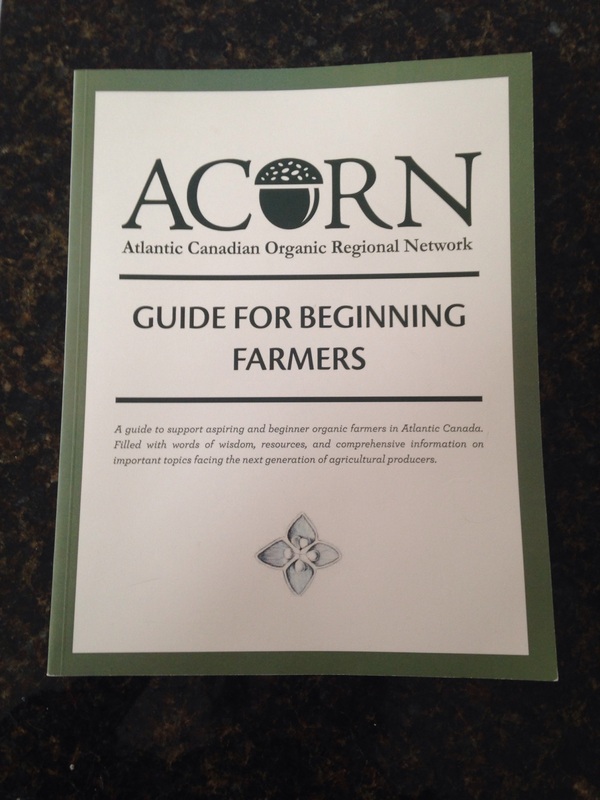 Stay tuned for re-printing plans for ACORN’s Guide for Beginning Farmers – a must-have for any new or aspiring grower! This 122 page manual features comprehensive articles, essays, illustrations, resource-listings, and words of wisdom from members of the Atlantic Organic Farming community, covering all of the essential topics that should be considered by one pursuing a career in organic agriculture. This Guide is currently ON SALE for $10 (or $15 paired with a Grow A Farmer Hat!) –regular price: $20– plus $10 for shipping anywhere in Canada (for the combo package, $7 for the Guide exclusive). If you are interested in purchasing a copy, please contact the ACORN office at 1-866-322-2676 (we accept Paypal, VISA/MC, Cheques and Cash!) or email acornoffice@acornorganic.org. There’s no two ways about it. It will be hard in the beginning. You will make mistakes. It goes with the territory. The most important advice I would give someone who’s thinking of starting a farm: do your research beforehand! First of all, make sure you know how to grow vegetables and that you know you’re ready and willing to do the work – physically, mentally, emotionally. Secondly, make sure you will be able to sell your vegetables, at a price that will allow you to make a decent profit, so research your market! I’ve heard others say you should never plant a single seed in the ground until you know where, how, and for how much you plan to sell that vegetable – and I would agree wholeheartedly. We had already been granted a spot in the farmer’s market in Charlottetown before we started our first season, AND we had conducted a survey the summer before to learn about people’s buying habits at the market. So we knew it was a fairly lucrative market and we felt confident that we could supply the market with interesting and tasty veggies. We also found that having an attractive display really helped our sales and helped us stand out at the market – which drew customers to us initially. But it was the quality of the produce that brought people back to us week after week and helped us develop a loyal following. Thirdly, it’s important to identify what’s most important to you and be flexible with the rest. I knew I wanted to start a vegetable farm. One business course we took called that our ‘driver’ – in other words, growing vegetables was the main thing driving our decisions. Where, how and to whom we were going to sell were still up for grabs. Initially I wanted to start a farm in my home state of Massachusetts, so we spent a year looking for land. After a year looking with nothing to show for it, we ultimately had to give up and start over elsewhere. I agreed to move to Canada to join my Canadian partner and the search for land in Atlantic Canada began. Once we realized we could afford to buy land in PEI, and discovered there was plenty of it available, we started researching our markets to make sure we could actually make a living selling vegetables. We met with other organic growers on the island first and learned that there was a growing demand for organic vegetables and not enough growers to supply that demand yet. We found the other growers to be encouraging and open to new growers moving here and found a very supportive community of farmer neighbours, and other like-minded young farmer entrepreneurs. Ultimately, being prepared was the best advice I would give anyone. Research your market, and grow the crops people want, set your prices based on your costs, not on what the other vendors charge. You may not be able to sell vegetables that are twice as much as the other vendors, but don’t be afraid to be the most expensive vendor at the market. By offering high quality, unique vegetables, we have found customers who are willing to pay a little extra for our produce, and we’ve developed a reputation based on quality. There are lots of other farmers trying to be the cheapest, we think that’s a race to the bottom and is ultimately not sustainable. But setting your prices is a difficult task. It’s a bit of a compromise between charging what you need to charge to make enough so you can continue to do this year after year, and not charging so much that people aren’t willing and/or can’t afford your prices. Be prepared to explain why you charge what you do – without getting defensive! Amy Smith and her partner Verena Varga operate a 1-acre diversified vegetable farm in Darlington, PEI. They grow over 40 varieties of tomatoes in two hoophouses, among many other exciting crops (like ginger!). They sell their produce to restaurants and at the Charlottetown Farmers’ Market. The Atlantic Canadian Organic Regional Network (ACORN) is a membership-based non-profit organization working to enhance the viability and growth of the Atlantic Canadian organic agricultural community through a unified regional network. Learn more at www.acornorganic.org.